The Fredericton Playhouse has announced its 2016-2017 Spotlight Series, which includes 31 professional performances in music, theatre and dance from a wide range of different genres. The Spotlight Series invites some of the most exciting artists touring today to the Playhouse stage, offering East Coast favourites, internationally acclaimed ensembles, up-and-coming musicians, innovative dance and circus shows, hilarious comedy performances, inspiring theatre pieces and much more. The internationally renowned Vienna Boys Choir returns to the Playhouse with quintessentially Viennese music, waltzes and polkas. Another group of beloved vocalists, Juno-winning a cappella group The Nylons will perform on the Playhouse stage as part of their exciting farewell tour. The season includes a second a cappella performance from country sensations Home Free, who rose to fame after winning NBC’s The Sing-Off in 2013. Audiences will love their high-energy show, quick-witted humour, and incredible covers of everything from Dolly Parton to Andy Grammer songs. Country fans will also be excited to hear that Alberta-based country star Brett Kissel is included in the Spotlight Series. Kissel has broken into the country scene in a major way over the last few years, with five consecutive top 10 radio hits. There are a number of powerful theatre performances coming up in 2016-2017, including the award-winning play Jake’s Gift, a moving piece about a Second World War veteran, which will be presented as a special Pay What You Will show. Rick Miller’s new solo performance BOOM explores the music, culture and politics that defined the Baby Boom generation through cutting-edge multimedia, unforgettable characters and tour-de-force storytelling. Roller Derby Saved My Soul has become a major hit on the fringe circuit, charming audiences across the country with its mixture of heartwarming honesty and snappy observations. Audiences will also be treated to a performance by former This Hour Has 22 Minutes actor Gavin Crawford, staring in his one-man show “FRIEND” “LIKE” #ME, a hilarious exploration of social media. 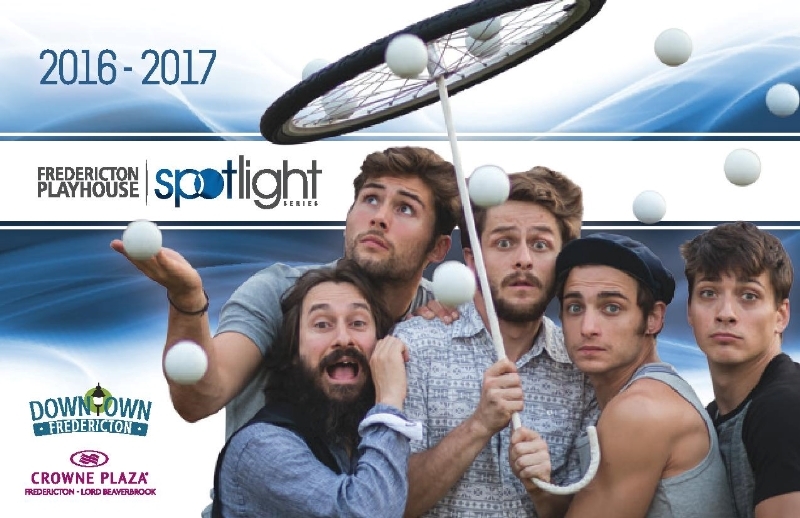 The Spotlight Series features performances full of wonder and spectacle, such asMachine de Cirque, a young, contemporary circus company whose show is both poetic and humorous, full of theatrics, acrobatics, juggling and much more. And the Playhouse will invite patrons to step beyond its walls to see Le Patin Libre, a group of former high-level figure skaters who bring urban street dance and high level artistic expression onto the ice, with a mix of movement, wit, speed and grace. They will perform their stunning piece Vertical Influences at the rink at Willie O’Ree Place in February. There are several exciting dance pieces in the season: versatile and provocative contemporary dance company Joe Ink will perform their emotionally resonant and visually striking piece, 4OUR; innovative group Out Innerspace’s newest piece, Major Motion Picture, will explore timely themes of surveillance, territory, propaganda and belief; and internationally acclaimed company Ballet BC will make its triumphant return to the Playhouse with three pieces from three celebrated choreographers, promising a performance that is powerful, thought-provoking and transformative. The upcoming Spotlight Series will feature a number of skilled singer-songwriters. Audiences will be blown away by Juno-winning folk musician Stephen Fearing’s powerful lyrics, creative arrangements and brilliant guitar playing. Danny Michel andFortunate Ones will join forces for an exciting double bill – Michel is an adventurous and fearless artist who slips into many different genres, from rock, to folk, to world music with ease, while Newfoundland-based folk-pop duo Fortunate Ones weave blissful vocal harmonies, guitar, accordion, piano and percussion to draw listeners in. Fans of East Coast music will also want to check out a special ECMA Songwriters Tour, featuring some of our region’s hottest up-and-coming songwriters, including New Brunswick’s Mike Biggar, Jordan Musycsyn of Cape Breton, Newfoundland’s Jon Pike, Nova Scotia’s Ian Sherwood, and Andrew Waite from Prince Edward Island.Còig, one of Atlantic Canada’s premier traditional groups, will show off their fiery Celtic style in a special Cape Breton Christmas show in December. Newfoundland-based trio The Once, known for their powerful vocals and expert instrumentation, will demonstrate their perfect blend of voice and melody. Another highly anticipated performance this season will come from rock band Sloan, celebrating the 20th anniversary of their Juno-winning album One Chord to Anotherwith a special tour that will stop at the Playhouse this fall. The quartet will perform the album in its entirety, along with other hit songs and fan favourites from their extensive catalogue. There are a number of productions in the 2016-2017 season with international connections. Roots: A Journey Through India will be presented in partnership with the Association of Indo-Canadians as a celebration of Diwali, the Hindu festival of lights, culminating in a performance by Bollywood fusion company DancewithSL.Immortal Chi brings the ancient traditions and rich theatrical history of China to life, with a spectacular display of Chinese martial arts and jaw-dropping acrobatics. Hailing from Spain, all-female quartet Las Migas boasts a fascinating blend of flamenco and Mediterranean styles, combining classical and contemporary rhythms. Comedy fans can look forward to a number of side-splitting performances, starting with the already announced special presentation, the hit off-Broadway showMenopause the Musical, coming to the Playhouse this October. Returning favourite Sharron Matthews brings her crowd-pleasing holiday show Sharron’s Christmas Party to Fredericton, combining stand-up with a pop concert for a fun, irreverent performance. Pat Kelly and Peter Oldring will offer a behind-the-scenes look at their award-winning satirical CBC radio show in This is That LIVE, featuring a mix of character interviews and mockumentary stories. New Brunswick’s own Tutta Musica and Hubcap Comedy Festival join forces on Symfunny Orchestra, a hilarious musical production, featuring beloved comedian Marshall Button, and Maestro Antonio Delgado and his orchestra. Fans of tribute performances will fall in love with the Rémi Bolduc Jazz Ensemble’s performance, Swingin’ with Oscar, an homage to jazz legend Oscar Peterson. Channeling a different genre, actor and musician Joe Matheson, known as “the quintessential voice of Hank Williams,” will pay tribute to the country great in Hank Williams Live 1952. The season features two exciting performances from audience favourites Classic Albums Live – The Beatles: Abbey Road, and The Eagles: Hotel California. Also in the tribute vein is the HillBenders’ performance of The Who’sTommy: A Bluegrass Opry. This imaginative recreation of the Who’s classic rock opera combines virtuoso musicianship and rock star vocals, bringing the hit album to life with a fresh, bluegrass sound. The season will also include a performance by Polaris Prize-winning artist Tanya Tagaq. Unnerving and exquisite, Tagaq’s unique vocal expression is rooted in Inuit throat singing, while incorporating electronic, industrial and metal influences to create music unlike anything else. The Fredericton Playhouse Spotlight Series includes a special Spotlight Membership option. For only $55, Members receive early access to the best seats in the house and special pricing on all Spotlight Series, Special Presentations and Spotlight Partner performances (Kidstage Series, Theatre New Brunswick, New Brunswick Country Showcase, Symphony New Brunswick and the Atlantic Ballet Theatre of Canada). Spotlight Memberships are on sale now and members can purchase discounted tickets to Spotlight Series performances immediately. Full priced tickets go on sale on July 29. For detailed information on 2016-2017 Spotlight Series performances, a season guide is available at the Playhouse box office or online at www.theplayhouse.ca.